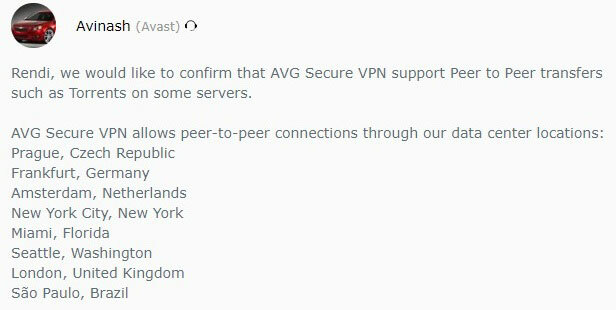 AVG VPN is probably a service that sounds familiar. 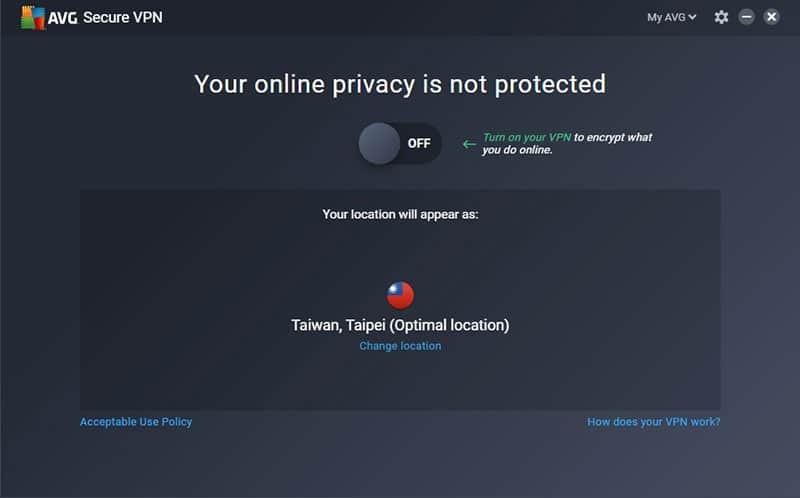 Not the VPN itself but the first name that pops up – AVG. That’s right, one of the biggest names in the antivirus market has extended its reach towards privacy on the internet. On the surface, AVG Secure VPN seems like it’s going to provide topnotch service since they come with a few positives. 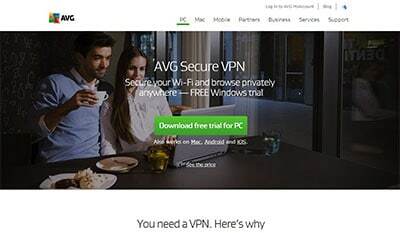 AVG Secure VPN offers its users a secure connection as it remains leak and virus-free. Their network also boasts competent customer support that’s available 24/7. All of these elements come crashing down, unfortunately, as it fails to deliver on a lot of the desirable features of a VPN service. They only use 2 protocols, their speeds are 50% slower, and Netflix is disappointingly blocked. Since AVG is a major player in the realm of anti-viruses, it’s only expected that they deliver in this area. And they do. I ran the Windows and Mac versions of the VPN service through Virustotal Scan. The results were pretty good. Unfortunately, I was not able to scan the iOS and Android versions because they’re unavailable. This was confirmed by their customer support. So far, they have proved that their overall network security, encryption, and private connection is safe from any leaks whatsoever. This will please all potential users of the service. Overall, the VPN provider did stellar work keeping my geolocation anonymous and away from exposure. It’s good news for those who use public wi-fi often. When looking at the quality of customer support, the response time for said service must come first. Luckily, AVG Secure VPN provides good customer chat support for its users. The chat support is not immediately available once you enter their website, but it can be easily accessed through their “contact us” page and heading to sale support. Once in, you only have to provide your first and last name, and your email address. You can then begin. Direct you to technical support. You will wait around 3 – 5 minutes before you can start. The support rep will direct you to their FAQ page to answer your question. Some support reps will try to answer your question to the best of their ability. This does take time but not as long as being transferred to a different rep.
AVG Secure VPN has a community support page that answers whatever question you have about the service. The response takes up to an hour or two, but there is a reply nonetheless. The available app that you can download for Windows and Mac has great usability. You can get the app as a free trial for 30 days so you can take a look at it for yourself. You can click the switch to automatically connect to an optimized server location. Like most VPN apps, the “optimized server” will vary from one location to another. Once connected, a notification will pop up and you can start browsing the internet under their security. The settings tab will show a number of options. One of these options being the choice to auto-connect to their servers once the app is launched. Overall, the app provided is fairly easy to use. There are not many tabs for you to go through and changing the servers manually enough. Furthermore, all apps or versions available of AVG Secure VPN have a built-in kill-switch for additional security. Data protection is always the biggest thing that a VPN provider must have. With the 14 eyes currently covering a number of major regions around the globe, it’s quite hard to find a VPN service that’s stationed away from their jurisdiction. AVG Secure VPN is proud to say that it stays away from malicious government agencies. The VPN provider is based in the Czech Republic which is not part of the 14 eyes. This means that user data and information are not so easily given to the government. However, the Czech Republic will cooperate against cases that break the laws of computer network exploitation. This is not much to be worried about but it is useful to know about. So far so good, right? Well, not quite. You’ll quickly see why all the bright features of AVG Secure VPN are trumped by the negatives of the service. For a service that’s backed up by such a big company, you’d think that AVG Secure VPN can deliver in terms of network speed. Unfortunately for this service, it falls flat on its face. The fastest server speed the VPN got to was Taiwan since it is the most optimized for my location. However, the results that followed were still quite bad. That’s pretty slow even for a server they claim is optimized. On the bright side, the upload speed did manage to break less than 50% which is okay. The following tests only showed the severe lack in speed for AVG Secure VPN. Horrendous download and upload speeds considering that these were the fastest I got from Europe. It’s just as bad as the EU server. 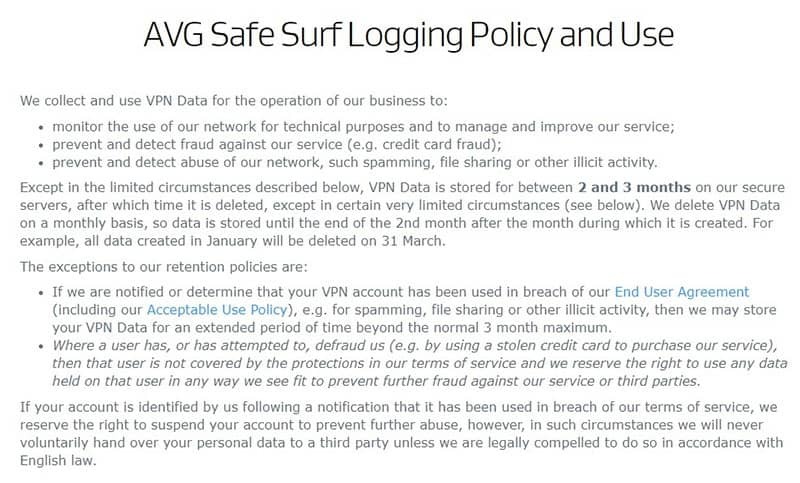 Right off the bat, AVG Secure VPN is quite straightforward with its logging policy. It claims to collect your VPN Data for a number of reasons. Said data is stored for 2 – 3 months before they delete it. The service will only keep your data indefinitely if you (A) break their EULA and (B) if the user has attempted to defraud the service. The statement is already worrying since it clearly says that it collects your data. This is where it gets a bit more suspicious, unfortunately. AVG Secure VPN claims to collect “VPN Data.” What is this data referring to? Their TOS never specifies what it contains. I contacted their privacy department via email and they are yet to send out a reply. Another thing that concerns me about their TOS is the purpose of keeping VPN data. One of these reasons states that it wishes to prevent any file sharing and other illicit activities. In order for the service to detect file sharing, it must theoretically know the websites that you’re using. To do this, it needs your usage logs which is a major red flag. This is only made scarier since “VPN Data” is a very broad term so it could mean a lot of things. 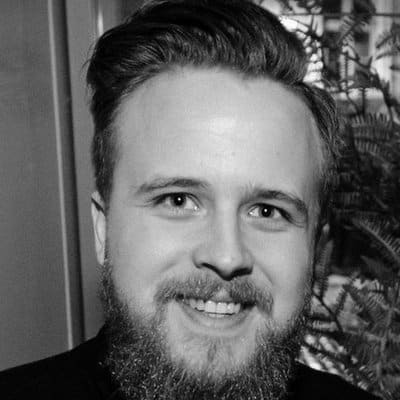 Regardless, collecting user logs is negative for a VPN provider. Data collection should only be limited to the basics such as email information, diagnostics, and billing info. Netflix means a lot for a great number of people around the globe. However, the service has taken a stance against VPNs during the last few years. Certain VPN providers manage to unblock Netflix and provides access regardless of location. 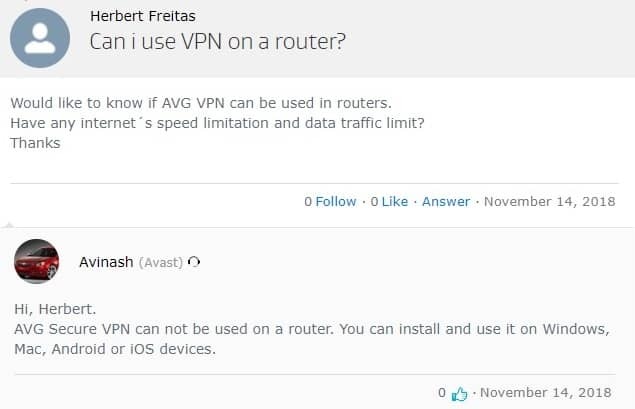 The same cannot be said for AVG Secure VPN, however. I first tested out 6 servers, 4 of which belonged to their locations optimized for streaming. The other two were picked randomly. The good news: most of the server locations in North America unblocks Netflix. The bad news: most of the other server locations do not. I further tested this for 5 more server locations spread across Europe and Asia. So far, only Japan has Netflix unblocked. The image claims that Brazil allows P2P but their Windows app says otherwise. The image above claims that Brazil allows P2P but their Windows app says otherwise. The rest of the available server locations do not have this feature. Limited choice for this feature holds it back in terms of flexibility and choice. All servers do provide unlimited bandwidth for those looking to torrent. So, there’s that. Just remember the speed you’re getting is still dreadfully slow. For a service that comes from AVG, you’d expect they have the power to extend their server count to a few hundred. Unfortunately, AVG Secure VPN only has 20+ servers. That’s lower than even most of the VPN providers that aren’t backed up by a big name company. This lack of flexibility carries over to their tunneling protocols. Right now, the service uses only OpenVPN and UDP for Windows and IPsec for Mac. That’s too low. It doesn’t work with PPTP but it still doesn’t provide enough alternatives for when a user wants to switch protocols. Seeing as different tunneling protocols provide different benefits, the lack of it here is quite disappointing. 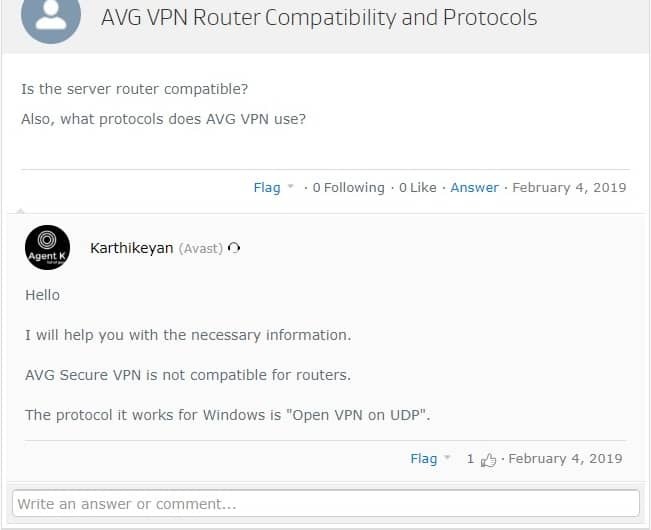 AVG Secure VPN is not compatible with TOR. TOR is an extra suit of protection and most VPNs work well with it. This one, however, doesn’t want to play with the other kids. It is not router-compatible. If you’re trying to protect a number of gadgets using AVG Secure VPN, you can forget about it. This article by Wired explains that AVG has the power to sell your browsing data to third parties. When a parent owner of a VPN service gets in trouble, it’s a good cause for worry. Do take note that the article is only shedding light on this fact and not actually saying that the company has already done it. Or have they? Remember, AVG Secure VPN collects your VPN Data. Said information could contain a number of specific elements and service is collecting it up to 3 months. Their transparency report states that they cooperated with the authorities in handing out user data as part of an investigation in the Czech Republic. A product of Avast, HideMyAss! VPN handed over user info that led to the arrest of a hacker. Avast was a victim of hackers that compromised CCleaner. The hacked version of the software was available for download for the coming weeks. AVG Secure VPN’s payment methods are quite confusing if you’re looking to buy their service. 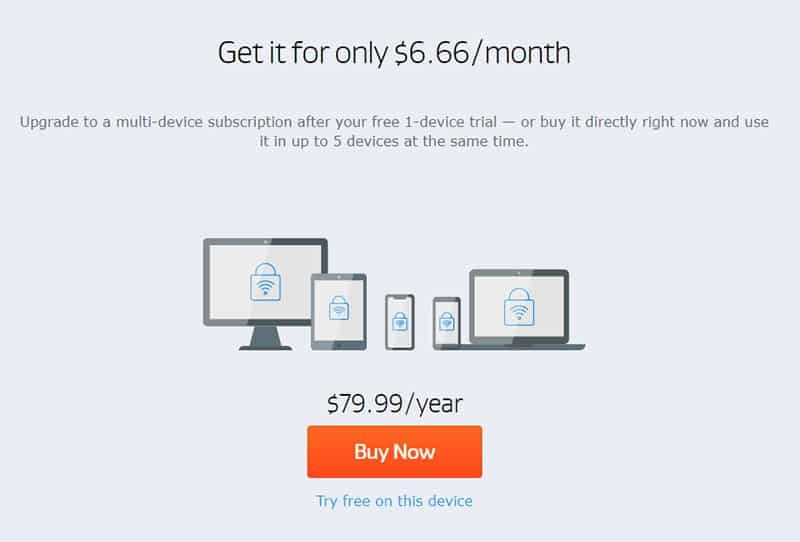 $79.99 a year for a VPN sounds steep, right? Well, that’s not all of it. This website fails to mention that the version that can be bought here is for one device only. I made sure of this fact by asking their sale support. The payment plans available are for a yearly subscription only. There is no monthly or quarterly offer. Unfortunately, AVG Secure VPN only offers limited payment methods. You can only pay through credit and debit card, or PayPal. 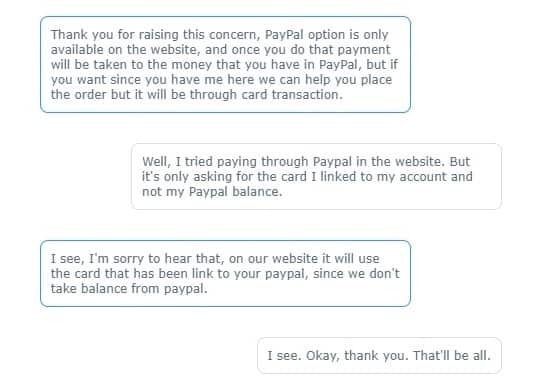 The PayPal method does not take your balance but instead asks for the card linked on the account. Though limited, the prices on offers are quite reasonable and are on par with all the other big name VPN providers. 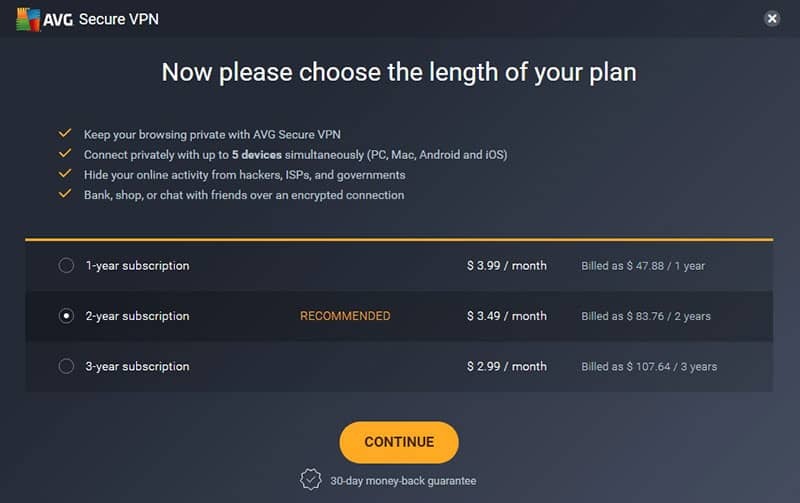 AVG Secure VPN offers a 30-day money-back guarantee. If you’ve already paid for a subscription and wish to opt out of it, asking for a refund within the allotted time is easily done. To start, you can contact their sale support and ask for a refund. They’ll go through the normal process of asking why you’re canceling your payment. The sale support will then notify you that their refund team will process the request and, on a successful submission, will email you the process in the next three days. This is an easy NO for me. First of all, you’re getting a VPN for the complete package; privacy is your goal but it doesn’t have to severely compromise your daily experience as well. Unfortunately for AVG Secure VPN, it fails to tick most of these boxes. It’s slow, doesn’t provide enough features and compatibility. Add to that, its parent companies are known to keep vital information for extended periods of time. All that dirt has finally caught up to them, I’m afraid. All in all, AVG Secure VPN feels like that old timer trying to stick to dated methods in a time where innovation and adaptability are required. My advice, go for the top names in the VPN market. It’s money well spent. P.S. I’m always interested in hearing your own opinions on the product. If you are or have used AVG Secure VPN, then leave a review! Let us know how your experienced differed.